Production Time 5 business days. Rush: 2 business days ($15.00 charge per 500 pcs applies. Virtual proofs are not possible with rushes). Express shipping options available at check out. Production times are usually firm, but may vary depending on production schedules. Setup Charge $20.00 per ink color. Easy to do business with this company. We received the beach balls today and they look great! Thanks you again so much for all your help and I will definitely contact you again when we need the next promotional items! The beach balls came in and they look great! Thank you for all your help! I received my beach balls yesterday evening - thank you so much! 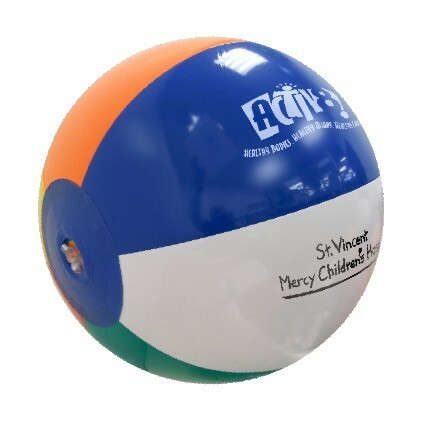 The balls look so cute and will be a great addition to our beach party theme! Thanks for all your help - I will definitely be doing business with you again! Have a great weekend! We wanted to let you know that we are very happy with the beach balls. We were very pleased with the quality of the balls and the print turned out beyond our expectations. Thanks for the great product. We look forward to working with you in the future. Thanks! Got our beach balls today, and they really exceeded our expectations. The quality was great and your customer service was just excellent. Thanks for helping us spot the mistake in our artwork. That really saved us! We are so excited to give these out, I think they are gonna rock our event this Saturday! We did extensive research online, and Promotion Choice's prices for beach balls are by far the BEST! I have to say we were a little worried about the quality when ordering, but we were so happy with the the beach balls when they arrived today. Not a fault with the printing and the beach balls looked absolutely wonderful. You can trust us to come back again.